This Navratra, have delectable yet low calorie treat of Kuttu Khichadi. The cooking process is easy and simple and can serve a platter full of goodness. Take a shallow frying pan and roast the peanuts till they are golden brown and crunchy. Keep them aside. Now, powder them and again keep the powdered peanuts aside. Now, wash the Kuttu in water. 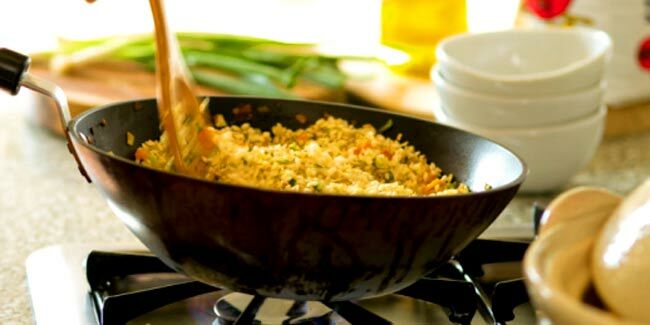 Take a deep frying pan and heat some oil or ghee. Throw in some cumin seeds, cook till they sputter. Now, add the ginger and green chilies and cook for a few seconds. Add the potatoes and then cook for another 2 to 3 minutes till the potatoes are crisp from outside. Keep stirring at intervals. You should better cut the potatoes in smaller cubes, so that they cook faster. Now, add the raw peanuts and cook for half a minute. Later, add the washed/rinsed Kuttu. Mix well and cook for 1 to 2 mins. Now, add water, sugar and salt. Now cover the pan with a lid and let the kuttu simmer on a low flame. Cook till the water is vaporized and the kuttu is cooked well. Give it a final stir and garnish with coriander.